The Night Before Christmas, this Norman Rockwell painting, appeared on the cover of The Literary Digest published December 22, 1923. Another commonly used title for this work is Santa Peering over Chair at Sleeping Child. Norman Rockwell did extensive work for The Digest. This was his fifth cover illustration for The Digest in 1923. Starting in 1918 with the first cover, Boy Showing Off Badges to the last, this painting, The Literary Digest featured Rockwell artwork a total of forty-seven times over five years. Surely that was the record. 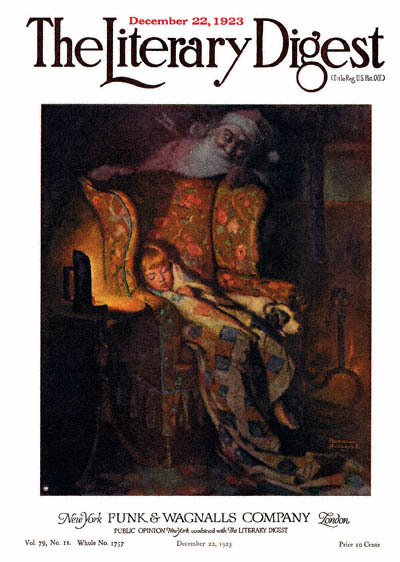 This Christmas 1923 cover, however, is the only one featuring Santa Claus. This painting has also been reproduced in Norman Rockwell, A Definitive Catalogue by Laurie Norton Moffatt on page 62. This illustration was also republished on the cover of the December 1946 issue of The Grade Teacher. This was the last Norman Rockwell painting to appear on the cover of The Literary Digest. The Night Before Christmas was only one of 47 Norman Rockwell Literary Digest covers; here is the list of more Norman Rockwell Literary Digest scans. The mischevious and yet still amused look on Santa's face really defines the picture. Even though the sleeping child in the foreground is the focus of the painting, Santa's presence here tells the whole story. The jolly elf has foiled yet another attempt to catch and spy him during his annual Christmas Eve giving spree. Notice the warm glow from the candle, illuminating the child's face. The child asleep in her chair, attempting to wait up for Santa Claus's arrival, aptly conveys the innocent feelings this painting conjures. Who among us hasn't tried to spy Santa in the act? But I wonder why the little dog is still asleep in the chair? Is Santa magic? Norman Rockwell, America's favorite illustrator, was also a master storyteller. His wonderful use of emotion fills this painting. No wonder collectors still love his work decades after its creation.